There are some amazing colors in the new Sephora + Pantone Universe Jewel Lacquers. But I will tell you the colors are completely camera shy. It was hard to catch the true color. But they all have super shimmer to them and applied well in two coats. The polishes had a great formula and the brushes were good. They also had a relatively quick dry time. 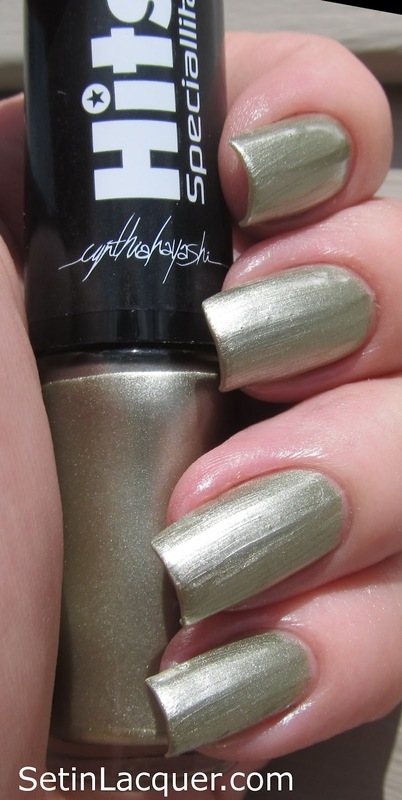 But my favorite part is the sensational shimmer to the polishes. Let's start with Evergreen. 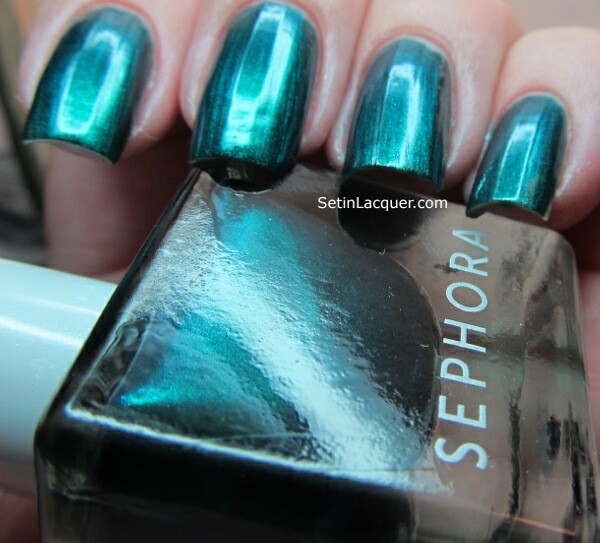 A deep, rich, shimmery, metallic forest green. Next up is Parachute Purple. It is a gorgeous, vibrant purple with tons of blue shimmer. My personal favorite is Reflecting Pond. Of course that means it is blue. A deep metallic, navy blue that simply lights up in bright light. Another favorite for me is Violet Quartz. Although I have to say I don't see the violet in the polish. It is a deep burgundy metallic polish. Very vampy and quite classy. 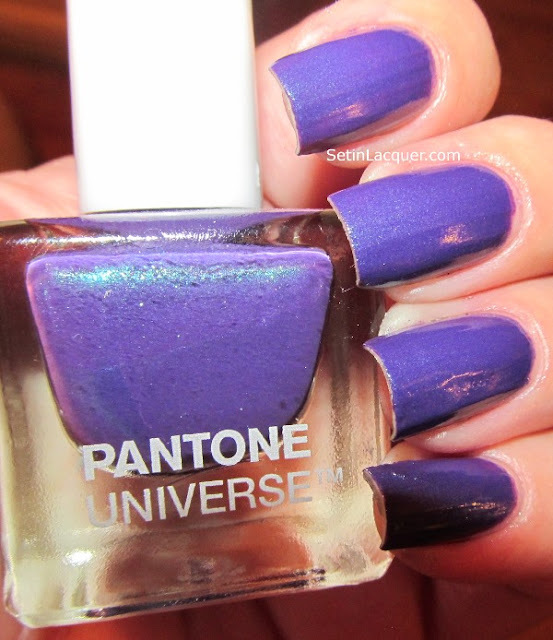 Sephora + Pantone Universe Jewel lacquers can be purchased for $9 for 11 ml. These great polishes are available on Sephora.com An OPI is 15 mil if that helps you make the size comparison. Bottom Line: These polishes will get used quite a bit as the weather cools and we segway into Fall and Winter. I will definitely be watching this line to see what other colors they come up with. I love the Hits brand of polish. So I really enjoyed swatching these polishes for you. Hits polishes are available at Llarowe. Llarowe is a one-stop shop for specialty nail polishes that aren't available in stores. These polishes provide great coverage. I had one really wonky brush, but the remainder of the brushes were good. I know you want me to just skip the babbling and move on to the swatches. All of the swatches below are two coats and no top coat. Oh, and in case you had any doubts the blue is my favorite. Pedra Do Sol is a gorgeous bright blue polish. It is my favorite of the bunch. My second favorite is this lovely sea foam green - Agua Marinha. It's a very soft color that has a wonderful sheen to it. Hematita is a soft silver shade. Not overly silver - but just the right amount of metallic silver without being too much. 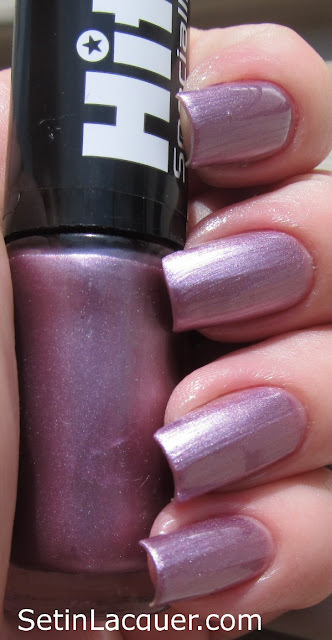 Hits Mica is a shimmery rose colored polish. This shade is subtle and classy. Hits Topazio is a wonderful color that reminds me of - yes - topaz. Soft with lots of shimmer and shine. Hits Pirita is a wonderful subtle gold shade. A perfect color for a day at work followed by a night on the town. 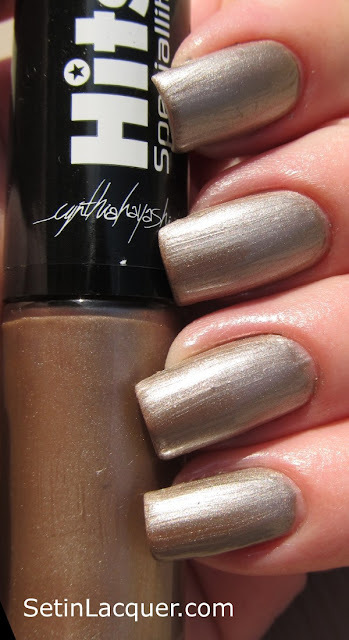 Bottom line: Hits overall is a wonderful brand of polish. A quick and easy application make this polish a wonderful addition to anyone's collection.